Rarely can the birthdate of a genre be established so precisely, and its father so clearly identified, than in the case of the emblem. Notwithstanding all its lookalike proto-manifestations, on 9 December 1522 the academic lawyer Andrea Alciato wrote to Francesco Calvo, a printer, announcing the invention of a new species of literary composition: 'During this Saturnalia, I have composed a little book of epigrams, to which I have given the title Emblemata.' Alciato saw these 'emblems' as recreative and entertaining: a relief and respite from serious academic work during the holiday period. He also hoped that these elegant trifles might entertain his intimate circle of erudite, humanist friends. The festive, saturnalian provenance of these compositions is not to be underestimated and was to exert an enormous influence on the tone and substance of the emblem tradition as a whole. 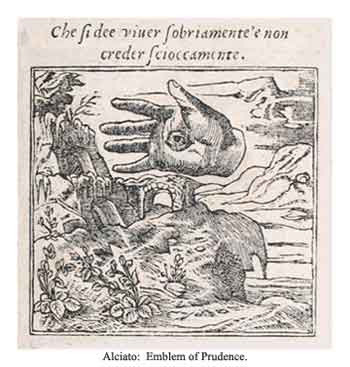 Alciato seems to have had no intention to publish these works. In all probability, this may well have more than a little to do with their festive provenance, their Rabelaisian, even Fescennine, mirth. Private jests uttered in a Bacchanalian setting rarely translate well when reproduced in the sober light of print. Such intimate mysterieis are not intended for publication.